When Leonard May turned 40, he sold his house, car, closed down his architecture business, and, with his wife, moved to Africa. May, 59, a candidate for Boulder City Council, became a mid-career Peace Corps volunteer, serving for two years in Malawi. The central African country qualifies as one of the 10 poorest countries in the world. “We felt like being in the U.S., we have a skewed set of interests and values and we decided that we needed to see how the rest of the world lived,” May recalls. During his Peace Corps service in Malawi from 1994 to 1996, he restructured the nation’s largest affordable housing program. He worked with local community organizations so they could become advocates for their needs in a newly democratic government. An underlying issue the program addressed was protecting women and children’s access to secure housing. In the patriarchal society, women and children could oftentimes become homeless because if the male in the family passed away, his property was inherited by another male in the family. May moved to Boulder 16 years ago. He and his wife Deborah Yin are partners in the Boulder architecture firm, May Yin Architecture. He was drawn to Boulder because of its beauty, but also found the level of engagement and social activism of citizens to be appealing. May and Yin built their own home in Boulder’s Newlands neighborhood, using natural materials in the construction process. They grow most of their vegetables in their own yard. May also serves on Boulder’s Planning Board and Historic Boulder’s board. He has past experience serving on the city’s Landmarks Board from 1995 to 2010 and on PLAN-Boulder County’s board from 2009 to 2012. May’s professional background has largely been shaped by experiences working and living overseas in post-crisis environments or working in disaster relief areas. “I’ve seen how government works and how it doesn’t work,” he says. After the tsunami in Sri Lanka in 2005, he managed a program to reconstruct hospitals and build sewage treatment facilities. Following Haiti’s 2010 earthquake, May directed a program to provide shelter and infrastructure reconstruction to a community of 50,000 people. In Bosnia, after the civil war, he worked for the U.S. Department of State and the Organization for Security and Cooperation in Europe to build democratic governments in municipalities and foster the return of ethnically cleansed populations. His own family history compelled him to become invested in the work as many in his family died during the Holocaust. Boulder City Council member Mary Young is endorsing May’s council bid. She’s known May for a decade and is impressed with his commitment to social justice. His resume—including his work in Haiti—shows that he genuinely understands issues such as homelessness and affordable housing. 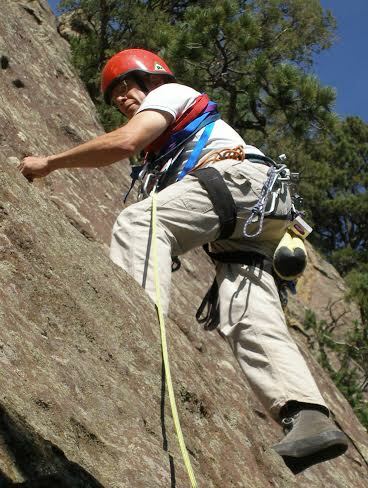 May, in his free time, enjoys rock climbing and skiing. He quips that he and his wife “forgot to have children,” during their travels, though they do have two cats—“Pip” and “Squeak”—who are sisters.